The panel during the G77 event on debt restructuring. Credit: G77/IPS. UNITED NATIONS, Nov 08 (IPS) - Despite many developing countries facing a very real risk of falling into debt crisis - the current options available to assist countries to manage their debts are surprisingly lacking. This scenario formed the basis of discussions on Monday 31 October at a Group of 77 (G77) seminar on "Sovereign Debt Vulnerabilities and the Opportunity for a New Debt Workout Mechanism building on the UN General Assembly process." "The challenging fact is that many countries…remain vulnerable to debt crises," said Thai Ambassador and G77 Chair Virachai Plasai in his opening address. 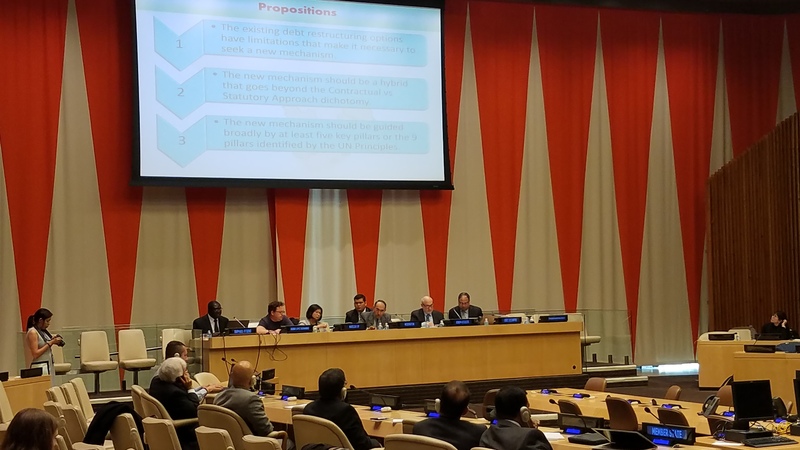 Other speakers at the event echoed Plasai's sentiments, during discussions moderated by Ambassador Ruben Zamora permanent representative of El Salvador to the UN. "The dramatic fall in commodity export prices and historically low interest rates have been key ingredients for a scenario which shows disturbing similarities to the build up phase of the third world debt crisis of the 1980s which cost in many countries a ‘lost decade of development'," said Ambassador Sacha Llorenty, Permanent Representative of the Plurinational State of Bolivia to the United Nations. Ambassador Llorenty was also the Chair of the United Nations General Assembly Ad Hoc Committee on Sovereign Debt Restructuring Process that resulted in the adoption of UNGA resolution 69/319 that approved the nine UN principles for sovereign debt restructuring processes. Speakers also noted that underlying issues, which contributed to previous debt crises, have not been adequately addressed. "The root of the debt problem has not been tackled or solved therefore the debt crisis should be on the top of the policy agenda," said Bettina Luise Rürup, Executive Director, Friedrich-Ebert-Stiftung New York Office. "Financial crisis is a recurring problem. Unless we have something in place that actually is a preventive measure for crises, we are going to see crises become worse and we're going to see no particular ways to protect vulnerable populations," he said. Dessima Williams, Special Advisor of Implementation of SDGs in the Office of the President of the General Assembly noted that despite debt forgiveness efforts for the world's poorest countries in the 1980s and 1990s debt has again begun to increase since the global economic crisis. Williams also noted that debt is not only owed to other governments and development banks, but that "a large share of debt is owed to the private sector." "A particular worry expressed in the recent International Monetary Fund fiscal monitor … is that while government debt has remained moderate the debt of the corporate sector across major emerging markets has risen sharply in the past few years." However despite the serious threats debt crises pose to sustainable development, currently the international mechanisms that exist to address the problem are remarkably lacking. In his keynote address, American Economist Joseph Stiglitz told delegates at the G77 event that these issues stem from the lack of a sound financial structure. "The current non-system is flawed and doesn't work," he stated as he called for a new debt restructuring process. Existing "gaps" in the international financial and legal systems have created opportunities for entities such as vulture funds to take advantage of distressed developing nations undermining any progress towards a new debt structure, Stiglitz noted. Meanwhile, as LeCompte pointed out, governments which fall into debt crisis are unable to declare bankruptcy, since bankruptcy is a measure which is only available at the domestic level. Previous rounds of debt forgiveness have also proved to be only temporary fixes. Raphael Otieno, Director of Debt Management Programme, Macroeconomic and Financial Management Institute of Eastern and Southern Africa, said that many African countries "started accumulating debt very aggressively," after previous rounds of debt forgiveness. Debt increases in countries like Angola and Ethiopia are "very worrying," said Otieno. Meanwhile, the measures imposed on countries to manage their debts can also be financially crippling, as Isidro López Hernández, Deputy and Spokesman on the Audit of Public Debt, Assembly of Madrid, Spain explained. "We are tied in a sort of metal cage," said Hernández, noting that when the government in Spain has even minor a surplus this must be directed back into debt repayment rather than investing in Spain's future. Plasai urged for the creation of a "fair, speedy and efficient debt workout" that involves close collaboration between debtors and creditors to resolve unsustainable debt levels. In order to restore debt sustainability, Stigliz called for the implementation of a "soft law regime" based on the UN General Assembly's principles on debt restructuring adopted in 2015. These international principles of laws will help encourage cooperation and a "healthier environment" for debtors and creditors, said Stiglitz. LeCompte echoed similar sentiments, highlighting the importance of laws around responsible and sustainable lending and borrowing. "We need to figure out, at the United Nations, how do we start to move into soft law, how do we start to create a framework and structure that allows…for problems to be worked out in a more responsible way," he told IPS. While the threat of debt crises can have significant negative impacts on development, speakers at the event also acknowledged that sustainably managed debt levels can also be beneficial for governments seeking to achieve the Sustainable Development Goals. "Borrowing is an important tool to finance sustainable development investments. Debt financing can support growth and smoothen the business cycle," said Nabeel Munir, Deputy Permanent Representative of Pakistan to the United Nations and Vice-President of the Economic and Social Council. "At the same time, debt needs to be managed prudently," said Munir. "We have witnessed one too many instances in which the debt default of one country could put the growth of the global economy into a halt, and hamper efforts to attain its development course." "(Although) the current scenario makes the effort of working towards a statutory framework for debt crisis resolution very relevant, (it is) not feasible in the short term." "Nevertheless," he said, the current General Assembly process is a "step in the right direction."